Mutation of the catalytic amino acids of the RuvC and HNH nuclease domains results in the creation of a catalytically inactive Cas9 protein, or dCas9, that still retains its ability to very specifically and efficiently bind double-stranded DNA sequences (Gasiunas et al. 2012). The dCas9 and guide RNA complex can be further modified to localize a transcriptional effector molecule to a gene or region of interest for very nuanced genome modifications (Mali et al. Sept 2013). For genome engineering purposes, this effector could be a DNA methylase to suppress the transcription of certain genes, or a histone acetylase to expose DNA for activation of transcription (Mali et al. Sept 2013; Gilbert et al. 2013). Fusion of dCas9 to transcription factors, such as the RNA polymerase omega factor for bacteria (Bickard et al. 2013), or human heat shock factor 1 for humans (Konermann et al. 2014), results in activation of the adjacent gene. Fusion of transcriptional repression domains such as a Krüppel associated box (KRAB) domain to dCas9 results in the formation of a highly effective transcriptional repressor (Mali et al. Sept 2013). 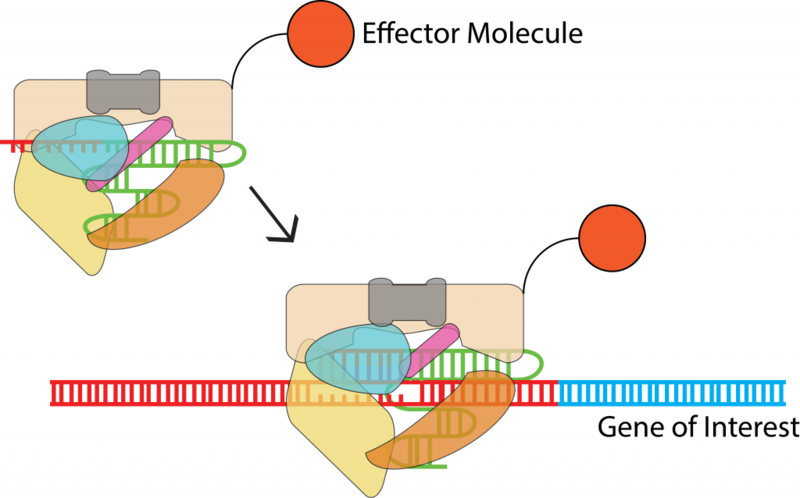 Thus, fusion of Transcriptional Effector molecules to a dCas9 protein with guide RNA results in the creation of a highly nuanced tool for modifying expression levels of almost any gene. Fusion of molecules to dCas9 is not just an engineering tool, it can also be used for more effective studying of specific genes. Fusion of an activator or repressor to dCas9 in order to target specific sequences can help identify the functions of new genes (Konnermann et al. 2014). Fusion of fluorescent proteins or molecules, such as quantum dots, to dCas9 can be used to locate the regions of DNA containing these specific sequences (Sternberg et al. 2014). 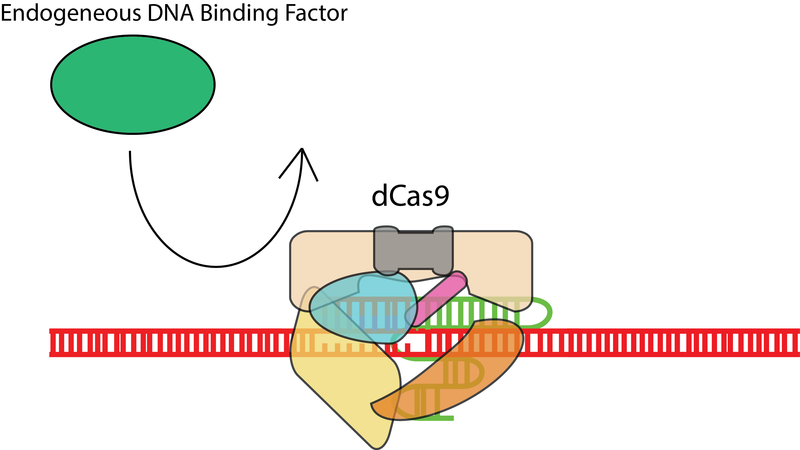 The catalytically inactive dCas9 can also be used to competitively bind regions of DNA, to prevent the binding of endogenous DNA-binding factors (Mali et al. Sept 2014). This includes RNA polymerase, and dCas9 has been demonstrated to very effectively inhibit transcription when bound to either the promoter sequence, to prevent RNA polymerase binding in the first place, or along the transcribed gene, to collide with RNA polymerase and cause premature transcription termination (Qi et al. 2013; Bickard et al. 2013).